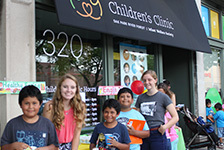 The IWS Children’s Clinic is a full-service pediatric clinic sponsored by the Oak Park River Forest Infant Welfare Society, a Chicago non-profit organization. We provide quality, affordable medical, dental and behavioral child health care services, supporting children from birth through age 18 from a single clinic staffed by diverse professionals who care. If you are interested in learning more about career opportunities please contact us.